Seven of the eight quarter-finalists have been confirmed, but there’s plenty to play for still in the last round of group games. Cork, Galway, Dublin and Donegal are all through to the All-Ireland quarter-finals. 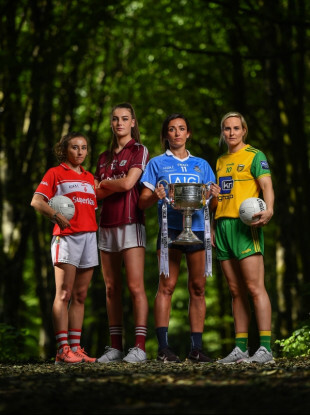 THE PICTURE FOR the knockout stages of the TG4 All-Ireland senior football championship will become clearer this weekend, with the final round of group games down for decision on Saturday. We already know seven of our eight quarter finalists after two weekends of round-robin action, but there’s still plenty to be decided with table standings impacting pairings in the last eight. The four provincial winners, Dublin — reigning TG4 All-Ireland champions — Galway, Cork and Donegal have all earned their progression in the race for the Brendan Martin Cup, as have Mayo, Kerry and Westmeath. The remaining slot will go to either Armagh or Monaghan — the Ulster sides drew on the opening day in Clones — but with the Farney having already fulfilled their two fixtures, it depends on the result of Armagh’s meeting with Cork in Ballinasloe. Also, one of the two — or the third-placed finisher — will join Tipperary, Waterford and Cavan in the relegation play-offs. Ulster champions Donegal and Munster finalists Kerry go head-to-head as the second part of an intriguing Dr Hyde Park double-header on Saturday afternoon. A win will send either side top of the group and facing up to the second-placed finishers in Group 2. A draw, and placings come down to score difference. Donegal v Kerry; Dr. Hyde Park, Roscommon, 3pm (LIVE, Spórt TG4 YouTube Channel, deferred showing at 7pm on TG4). After losses to both sides, 2017 All-Ireland intermediate champions Tipperary are heading for the relegation play-offs and it’s 3rd in Group 1 v 3rd in Group 3, meaning they’ll meet Waterford to fight for survival in the top flight. This is a group many will have their eye on on Saturday with one of Armagh and Monaghan heading for the quarter-finals while the other goes to the play-offs. That’ll all be decided in Duggan Park, Ballinasloe as the Orchard county come up against Ephie Fitzgerald’s rising Cork side — gunning to make amends as their bid for 12 All-Ireland titles in 13 years was ended at the semi-final stage last year. A draw or a win would send Armagh on their way, while a loss would give Monaghan some hope as it comes down to score difference. The 3rd-place finishers face Cavan in the relegation play-offs. With Galway and Westmeath both on three points in the table, their clash in Ballinasloe with three more points up for grabs is eagerly anticipated. Stephen Glennon’s Tribeswomen look really strong to date, but Leinster finalists Westmeath showed great character to edge past Waterford in their meeting and virtually seal their quarter final spot. Westmeath v Galway; Duggan Park, Ballinasloe, 2pm. And aforementioned, the Déise are preparing for a relegation play-off clash against fellow Munster outfit Tipperary. As the groups were confirmed and the revamped round-robin stages finalised, one fixture surely stood out to everyone around the country — Dublin v Mayo. A repeat of the 2017 TG4 All-Ireland senior final, a repeat of the 2018 Lidl Ladies National League Division 1 final — both won by Mick Bohan’s Sky Blues — they face off once again in Dr Hyde Park on Saturday. Dublin v Mayo; Dr. Hyde Park, Roscommon, 1pm (LIVE, TG4). The Westerners have had a difficult few weeks with 12 players leaving the panel but they’ve done their talking on the pitch and will hope to continue to do so again this weekend. The Breffni elsewhere, are looking towards the relegation play-offs and will meet Armagh or Monaghan after defeat to both Dublin and Mayo. Source: TG4 Championship 2018 Guide. 1) 1st Group 1 v 2nd Group 2; 6 August. 2) 1st Group 2 v 2nd Group 3; 6 August. 3) 1st Group 3 v 2nd Group 4; 12 August. 4) 1st Group 4 v 2nd Group 1; 12 August. Result on the day (if still level at full-time, extra-time will be played followed by 30m kicks). Winner QF 1 v Winner QF 2; 18 August. Winner QF 3 v Winner QF 4; 25 August. The two winners then face off in the All-Ireland senior final in Croke Park on 16 September (replay 30 September, if necessary). And on the relegation front, the two losers of the two play-offs — Tipperary v Waterford and Cavan v Armagh/Monaghan — face off in a relegation battle on 18 August at a neutral venue, with the loser sent down to the intermediate ranks for 2019. Email “Closer look: The state of play of the TG4 All-Ireland senior football championship”. Feedback on “Closer look: The state of play of the TG4 All-Ireland senior football championship”.